Although it's a order and pay at the counter first system, you are then provided with a number so you can sit down, and they bring everything to you at your table. After they brought me a moolicious mimosa, my entrée and dessert arrived shortly after. 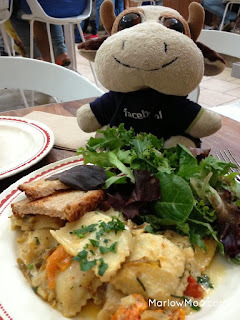 Their pasta special was ricotta ravioli with heirloom tomatoes, Coke’s Farm sunchokes, Treviso radicchio, and a cantal cheese sauce, with a side of bread and salad. The portion was quite generous considering the price, and I didn’t even wind up eating much of the bread or salad as a result. The ravioli filling itself was creamy, while the pasta was tender, and there was just enough sauce coating each morsel of ravioli, as opposed to drowning the pasta like some places do. The lemon tart had a flaky, crispy pastry and a slightly tart and creamy filling, yet felt surprisingly light once eaten. Service was quick and friendly, the price significantly lower than in a restaurant, but the food was still restaurant caliber. I can only hope that La Boulange expands outside of San Francisco, as I would really enjoy a casual café like La Boulange with great pastries, serving well-prepared food, but also has alcohol available. If you’re looking for a quick, inexpensive meal while in San Francisco, give La Boulange a whirl, especially if you like lemon tart as much as I do!